Kaifeng - The China Taichi Guide is a Directory of Tai Chi Schools & Tai Chi Teachers in China. Kaifeng is one of the ex-imperial capitals of old China. As with many cities in Northern China, first impressions when one arrives at the bus or train station are not that inspiring. It seems to be simply another non-descript Chinese city with quite poor air quality. While this is true, especially around the outskirts, the inner city itself has retained some of its character and historical charm. 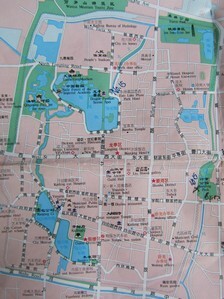 It is walled and is full of large lakes and parks, once part of the Imperial residence. Much of the city comprises recently renovated large buildings and glass fronted shops. This is modern China, although in Kaifeng the buildings don't rise too high due to the instability of the ground and archeological history below. If the air quality was better, many areas of the city would actually be very pleasant so this is a big shame. Thankfully the area is not as bad as Handan. There is now quite a good place to stay in Kaifeng : The Kaifeng International Hostel. Reasonable single or double rooms were 120Y/140Y per night and possibly one can bargain if you stay for a week or so. The hostel provides Western & Chinese food as well. During the Cultural Revolution, one of the Chen Xiao Jia Masters, Chen Ke Di was invited to stay in the home of a local Communist General, a war hero from the Korean war. The General, called Shi Lei was left in very poor health following the war and learning Tai Chi with Chen Ke Di was his way back to good health. An impressive demonstration of the therapeutic qualities of tai chi when practised properly. Chen Kedi taught other students in Kaifeng as well and so this created quite a lineage of high level Small Frame Chen Style Tai Chi in the area. 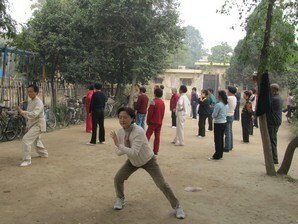 Many of the practitioners meet at Bian Jing Park every morning for classes. It may be possible to learn with some of the teachers there. Shi Lei himself doesn't teach any more, but his disciple teachers Tai Chi is very high quality. I practised pushing hands with an old student of Chen Kedi and Shi Lei, Teacher Zhang. Please note : This is a private class, so if visiting, one needs to be respectful. I met another old student of Chen Kedi, Ma Jin Yu, whose Chen Xiao Jia seemed quicker with smaller movements than the others I saw. Again his pushings hands was very strong and he seemed to take a more martial approach to the taichi. It looked like he had had a mild stroke sometime, effecting one of his eyes but it didn't seem to affect the quality of his tai chi. He appeared interested in teaching and can be contacted on 13613782692. So even though it isn't an ideal location I could imagine spending a few weeks there learning Chen Xiao Jia Tai Chi or practicing high level pushing hands. The China Taichi Guide : An Introduction to Kaifeng. 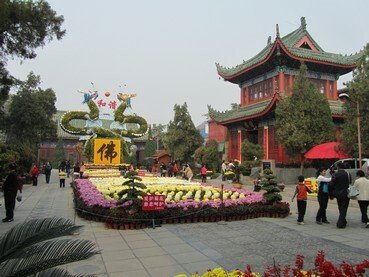 Kaifeng is the home city for one of the main lineages of Chen Xiao Jia Tai Chi. The China Tai Chi Guide is a directory of Tai Chi Schools and Teachers in China.